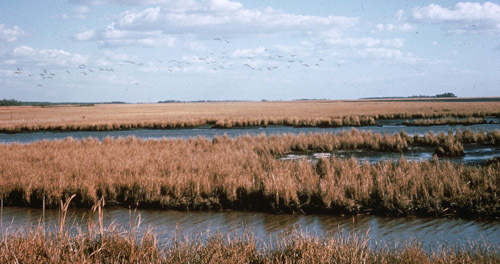 Established in 1933 as a stopping point for migratory birds following the Atlantic Flyway, Blackwater National Wildlife Refuge, just south of Cambridge, MD, currently encompasses more than 27,000 acres of rich tidal marsh, freshwater ponds, and mixed evergreen and deciduous forests. Recent bird spottings there include Bald Eagles, Snow Geese, Canada Geese, White Pelicans, Barred Owls, Great Blue Herons, Peregrine Falcon, Wild Turkeys, Tundra Swans, Golden Eagles, and many, many more. The number and species of wildlife change with the seasons. 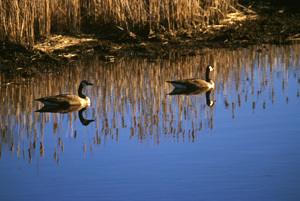 In winter, tens of thousands of geese, swans, ducks, and pelicans fill the waters and the sky along Wildlife Drive and throughout the refuge, and a wide variety of smaller birds and mammals — including the elusive red fox — find homes in the woods along the Drive and hiking trails. The stars of the show are the bald eagles, recently removed from the Endangered Species List, and the eaglets in particular. The refuge eagles have been getting national attention, thanks to a live Eagle Cam mounted on one of their nests. Close-up images from the live web cam appear on www.friendsofblackwater.org. Be forewarned — the nests aren’t always a cute and cuddly place. Though fish is their preferred meal, eagles also eat small mammals, other birds and carrion. Dead rabbits have been known to appear in the nest — a bit startling if you’re not expecting them. The Annual Eagle Festival takes place in March. Geared toward families, the day is packed with educational presentations and fun. You can build a bluebird box, learn to identify raptors, go on one of the famous Eagle Prowls, listen to Native American music, watch a puppet show, meet authors and photographers, see a live bald eagle and a trained peregrine falcon, or learn how to create a backyard wildlife habitat. All activities during the Festival are free and the entrance fee to the Wildlife Drive is waived. If you can’t be there for the Festival, bring your binoculars and camera and come and enjoy the serenity of a more typical day at the refuge. You can pick up a map of the paddling trails and hiking trails (one of which, the Marsh Edge Trail, is a wheelchair-accessible paved path) in the Visitor Center before you set out. If your time is limited, or you happen to be there in summer, when the flies and mosquitoes take over the marshes and woods, stay in your car and follow Wildlife Drive as it meanders along fresh water ponds, through woods, past fields, and adjacent to the marshes. Wildlife Drive and outdoor facilities open daily, dawn to dusk, year-round. Photos, from top to bottom, by: Earl Cunningham, George Gentry, and Don Pfitzer.